It’s trite but true – win the turnover battle and you likely win the game. Last year the Eagles went 6-5 while giving up seven more turnovers than their opponents. That a 15-turnover drop from 2014 when they went 11-3. Want more proof? The 2010 national championship team was plus 13. Eastern opponents will undoubtedly focus on all-American wide receiver Cooper Kupp, who last year caught 114 balls for 1,642 yards and 19 touchdowns. But they’d better be aware of the other threats, especially Kendrick Bourne (73 catches, 998 yards and eight scores. Everyone: Last year, Eagle opponents converted 12 of 16 field-goal attempts, while Eastern attempted just six field goals – the lowest figure since the school moved to Division I play more than three decades ago. On the other hand, few were more important than Jordan Dascalo’s game-winning 44-yarder as time expired to give the Eagles a 43-41 win at Northern Colorado. A big key to success for the Eagles will be third-down defense. Last year, opponents converted 49 percent of their chances (84 of 169), including 68 percent in the Eagles’ November losses to Northern Arizona, Montana and Portland State. Included in the most recent recruiting class are some of the highest-rated athletes ever to commit to Eastern. Among the players rated at two stars or higher by Rivals.com and Scout.com are quarterback Eric Barriere, running backs Antoine Custer, Tamarick Pierce and Jason Talley and offensive lineman Conner Crist. That’s Eastern’s winning percentage against both Montana and Montana State in the past five meetings with each school. EWU had won four straight against the Griz, a streak that ended last year. The Eagles are on a four-game win streak against the Bobcats. 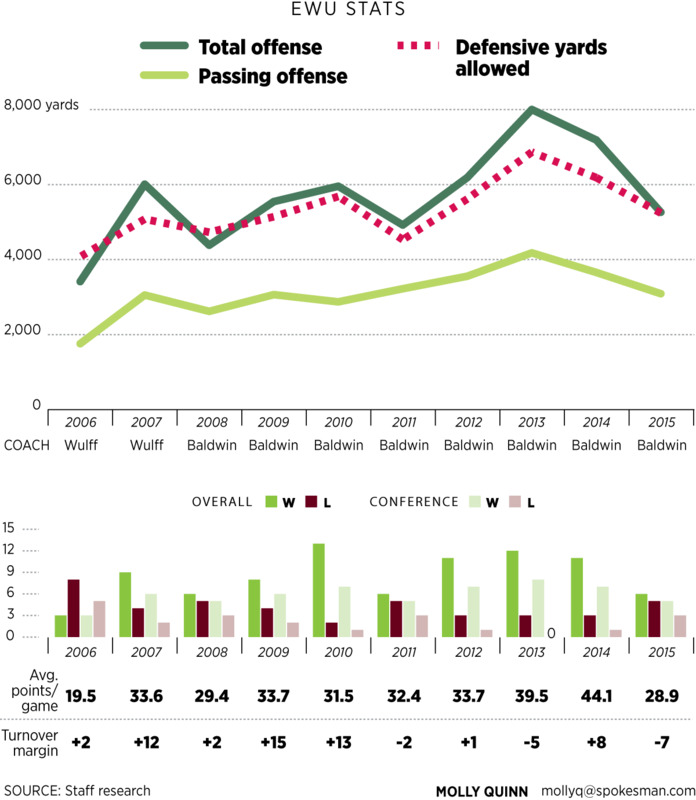 Wins by EWU coach Beau Baldwin since he took over the program in 2008. Baldwin is 73-30 overall and 50-14 in Big Sky Conference games, tops for any Eastern coach. The total turnovers forces by last year’s Eastern defense. Opponents had 24. That’s how many straight winning seasons the Eagles have posted since beginning the streak in 2007.